Dell has added a cheap and cheerful widescreen laptop to its Inspiron line, with the new range starting at £369 and featuring a widescreen 17.3 inch display. Dell's new Inspiron 17 also has an LED backlight for its large display, and offers various multimedia capabilities and upgrade options, including an optional Blu-ray drive and a high-definition 1,600 x 900 display. A full 1080p HD screen option is soon to be introduced, Dell also informs us. For the fashion conscious laptop consumer, Dell's new Inspiron comes in a choice of seven case colours, with hard drive options up to 500GB, RAM up to 8GB, and an optional ATI graphics accelerator chip. The processor options include Intel Celeron or Core 2 Duo chips up to 2.4GHz, featuring the standard 802.11g or n Wi-Fi and Bluetooth functionality. And sure, while the processors are hardly going to be the fastest things off the block (unless you overclock your new Dell lappy, of course! 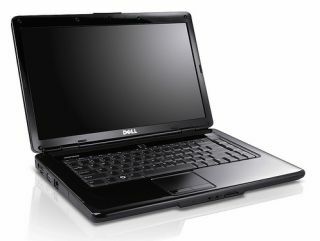 ), they are more than capable of handling basic everyday applications such as Microsoft Office or playing your DVD or Blu-rays on the Inspiron's lovely wide screen. Though if it is power or gaming capability you are looking for then you really need to look elsewhere (and perhaps rethink your budget a little!). Strangely, Dell describes the Inspiron 17 as an ultraportable, but the fact that we could only just about squeeze it in our laptop rucksack combined the fact that it weighs in at 3.1kg with a standard six-cell battery pack (with a longer-lasting) nine-cell battery is also available, suggests to us that it is more of a 'large laptop'! Prices start at £369 plus VAT for a model with 2GB memory, 160GB hard drive and 2.2GHz Celeron processor. Not bad, Dell!